Impossible Truck Tracks Drive is an awesome truck drive simulator from Tech 3D Games Studios. You can drive amazing trucks on massive heights to touch the skies like a legend. Driving big trucks on impossible tracks that are sky high is dangerous task for this you need real truck driving skills. Get behind the wheel of a huge truck with big steering in hand to perform your duty as a legend truck driver. While controlling impossible truck driving take care of obstacles and flying helicopters or your truck will be crashed. Roads are impossible to drive and one mistake can cause a huge destruction to cargo truck. 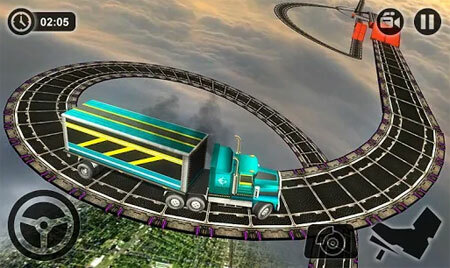 The game features realistic physics for real driving experience on impossible tracks. Experience amazing tracks dangerous sharp turns with jumps and obstacles. If you get stuck in the game, check out the video walkthrough and gameplay for the game. This entry was posted in Android Games, Mobile Games, Walkthrough and tagged Impossible Truck Tracks Drive Cheats, Impossible Truck Tracks Drive Gameplay, Impossible Truck Tracks Drive Guide, Impossible Truck Tracks Drive Strategy, Impossible Truck Tracks Drive Walkthrough by Marvin. Bookmark the permalink.